Decorate your Disney Frozen Birthday Party with this 3.2 metres x 25 cms large birthday banner decoration that you can customise to any age! Our Frozen Add an Age Letter Banner is a paper letter banner featuring beautiful floral prints, as well as Elsa, Anna and Olaf. The center cutout can be customized with the birthday princess's age on her special day! 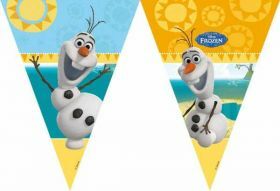 With strings at both ends, this festive birthday banner is a great addition to a Frozen birthday party and is easily displayed in the party room.